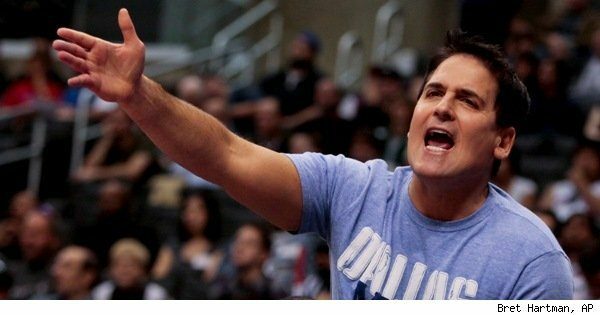 Mavs Owner Mark Cuban is looking into starting a REAL NCAA Championship Playoff system for College Football. There are precedents for starting a true playoff. Pryor to the first NCAA Basketball National Championship Tournament, the National Invitational Tournament was the “unofficial” championship. It took a few years before the NIT became a footnote and the NCAA Tournament became the central focus as the “real” championship. Cuban wants to replace the BcS and most of the football world (except the pinhead ivy covered college presidents) agrees it should go. Cuban is totally correct that there would be a lot more money generated by a national playoff than by the 34 bowl games plus the BcS Championship game. Question 2– Would the really good teams sign up to play vs going to a BcS bowl? I will leave it to you. Do you think the undefeated TCU would rather play in an 8 team playoff for a national title rather than playing a one loss Wisconsin for all the roses in the Rose Bowl? I think so. Would Ohio State rather play Arkansas in the Sugar bowl or have a shot to win a national championship? No, they would rather have a shot at the big game. Now an even harder question. If you were undefeated Oregon or Auburn, would you rather receive a crystal football from the BcS or win a true playoff? If the other top teams were going to the playoff, I think both would opt out of a fictional championship for a real playoff. That is particularly true of Auburn who could lose their BcS championship if QB Newton is eventually found to have been ineligible. When you win a playoff similar to that in the NFL, you have much more credibility. The only thing that is more important to college presidents than their dedication to a far left agenda is their greed. Pay them and they will come. The TV rights to an 8 team playoff has been estimated to be worth 2 billion dollars. That is where the playoff would probably start. If it started this season, here is what the playoff would look like. 7 Oklahoma v 2 Oregon – Winner plays the winner above. The first round would be played today and tomorrow. The second round would be played the following Saturday and the finals would be played on Jan 1. The rest of the bowls could go on as usual. There would be 4 fewer bowls. The ones to go first would most likely be the New Mexico Bowl, the uDrove Humanitarian Bowl, the R+L Carriers New Orleans Bowl and the hardest to give up–the Beef ‘O’ Brady’s St. Petersburg Bowl. Somehow, I can face another day without those great games if there was a real playoff at the end of the season. So, that is the plan. Do you think that would be a better system than the BS–I mean BcS?